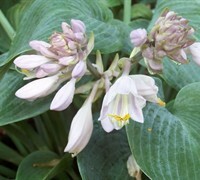 Hosta X Tardiana 'Halcyon' is a moderate growing perennial plant that can be grown in USDA Plant Hardiness Zones 3A through 9B. It matures to an average height of 1 foot to 2 feet and an average width of 2 feet to 3 feet, depending on climate and other environmental factors. It prefers growing in a location that provides shade, morning sun with afternoon shade or filtered sun and grows best when planted in loam or clay soil that is well drained or moderately drained. The foliage is blue in color. It attracts butterflies, hummingbirds and visual attention and is resistant to insects, diseases and heat. 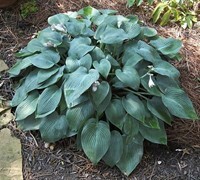 Halcyon Blue Hosta can be useful in the landscape in mass plantings, in foundation plantings, in containers or planters, as a border or edger, around decks, swimming pools, and other outdoor living areas, as an accent, under a shade tree, in landscape beds or islands, to accentuate entryways or in small groupings and also in theme gardens, cottage gardens, perennial gardens or shade gardens. 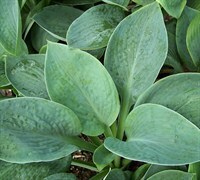 Halcyon Blue Hosta Lily has medium-sized, heart-shape, frosty ocean-blue leaves that form a compact mound in the garden. White to lavender bell shaped flowers appear during summer on tall stalks that rise above dense mounds of foliage that is 18" in height with a spread of about 2 to 3 feet. Here in Texas we had a horrible winter, extremely cold then very warm and freezing again. This plant is big and beautiful and the star in my shade garden. I truly do love it.